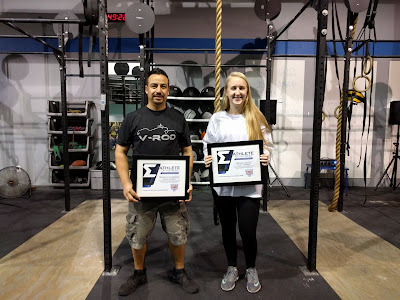 Manolo and Abigail were our athletes of the week for 18.2/18.2a! Great job you guys! Keep up the good work and keep giving those workouts everything you got! *Hold dumbbells in both hands. Lunge by stepping forward onto a 45# plate to create a deficit.